« Dum dum dum dum, dum dum dum dum, EAD! EAD! Today is International Women’s Day, and this year’s theme is “Equal rights, equal opportunities: Progress for all.” And I have something to say about that. But it’s not something I like to talk about, so I made a comic instead. So, in a messed up way, without sexism, there would be no DnD! It’s not always easy being a lady in comedy. 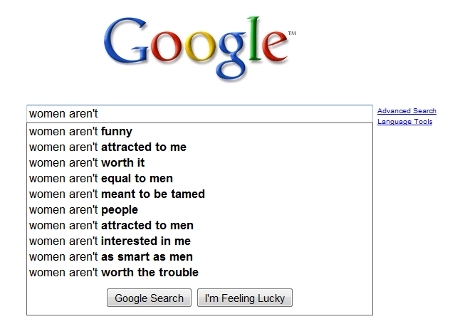 Even Google thinks so. So thanks for reading, Derangers, today and always. This entry was posted on March 8, 2010 at 8:00 am and is filed under photocomics. You can follow any responses to this entry through the RSS 2.0 feed. You can leave a response, or trackback from your own site. This is so great! Thanks for being an awesome ovarian librarian. Ovarian Librarian! I love it! And OOOOOOH how I hate Christopher Hitchens. I found him detestable before that Vanity Fair piece, and I now feel physically sick when I think of him. BOO CHRISTOPHER HITCHENS, BOO! You writes good for a girl! I love your creative ways of making statements; they stick around the mind longer than a piece of written text would. Also, would you mind if I re-posted this on my blog, the patriarchive? Not at all! You can either repost the whole thing with a link back to my post, or make a new image of just the first couple of panels, and use that to link back. That’s a fun game with Google! It turns out that men aren’t men anymore. Stupid feminism! We’re only real men if we can keep women from staying up in the archives past their bedtime, I guess. great post. as i was reading it, i was thinking about that asinine article by hitchens, too. They say gender or racial privilege is invisible to those who benefit from it: I have never had such a question asked me in an interview that I recall and so I couldn’t believe that someone actually would ask you that. And my wife is one of the funniest people I know. I do think such blatant sexism is rare, and I’ve never had anything like it happen to me before or since. The reaction in panel 3 is genuine. I love Wondermark! I think we have very different styles, though–I usually come up with dialogue first and look for pictures to match, while Wondermark comics seem to be more motivated by the picture content. Most brilliant bit: “I’m sure once he gets to know you…” LOVE it!